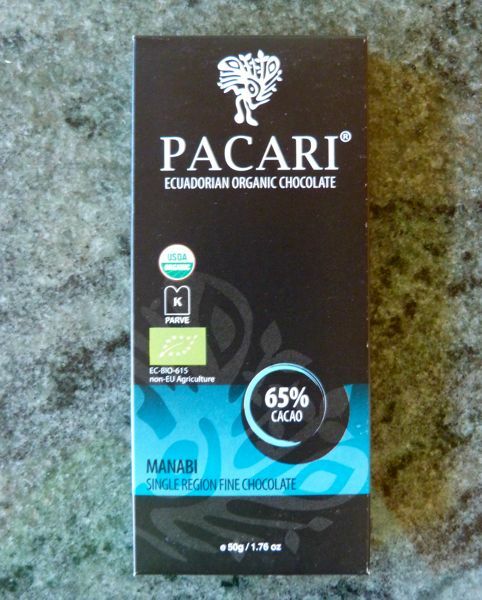 Pacari Chocolate's line of organic, single origin, and raw bars from Ecuador provides one of the best samplings available (short of visiting South America) of cacao flavors from this country that lies in the heart of the cacao growing zone. 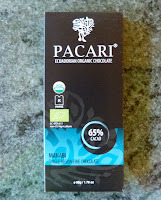 Today's single origin, 65% cacao dark chocolate bar was made with beans from the Manabi region. (Yesterday's bar was from Los Rios.) There was a light fruit plum note at the beginning, a relatively pleasant mouth feel and light finish. My only quibble: a very slight hint of white powder (more in flavor than texture). Today was Day #5 of Chocolate and Ecuador Theme Week.